Geothermal energy has been seeing strong growth in recent years, but much of this growth is going uncelebrated. This form of renewable energy is not often considered to be as attractive as solar and wind power. In some cases, even hydrogen fuel cell receive more attention than geothermal power. The inherent energy of the planet holds a great deal of promise, however, especially as fossil-fuels become less favorable. 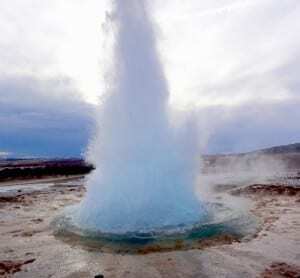 Last year, global geothermal energy capacity reached 12,000 megawatts, growing 3% from what it had been in 2012. This represented the greatest growth that the geothermal sector had seen since 2007. The relatively slow growth of geothermal power has little to do with its potential. Notably, the upper six miles of the earth’s crust have 50,000 times more energy potential than the entire world’s oil reserves. This energy is not easily obtainable, however, when compared to solar and wind power. The effort required to tap into geothermal power, as well as the cost of such an endeavor, is one of the less attractive aspects of this form of clean energy. If a geothermal project can obtain the funding it needs to take form, it can generate electrical power all day, year-round, with little operational and maintenance costs. Geothermal systems are often cost competitive with their more conventional counterparts, despite their high initial cost of development. In some parts of the world, geothermal system can even rival nuclear energy plants in terms of power generation capabilities. The United States, Philippines, and Indonesia are the three countries where geothermal power has found the most success. In particular, California boasts of the majority of the geothermal capacity in the U.S., representing some 3.4 gigawatts of online capacity. Geothermal energy has been gainng more support in recent years because of the economic prospects of renewable energy in general, but this form of clean power is not often praised for its potential. As such, relatively few people are aware that geothermal energy is as valuable as it actually is.